(Text automatically translated) NEAR Mont Ventoux, VILLAGES OF FALLS AND MONTBRUN LES BAINS (thalassotherapy center) QUIETLY AMONG THE LAVENDER FIELDS IN HAMLET ISOLATED TO RENT A COTTAGE TOTALLY RENOVATED ONE (50 M2) IN AN OLD HOUSE. ACCESS AND GARDEN RELATED INDEPENDANTS.POUTRES, DECORATION NEAT. FOR PEACE GARANTIE.IDEAL HIKING WALKING OR BIKE LOVERS OF FESTIVALS OR WANTING TO BE IN PEACE IN THE DAY. 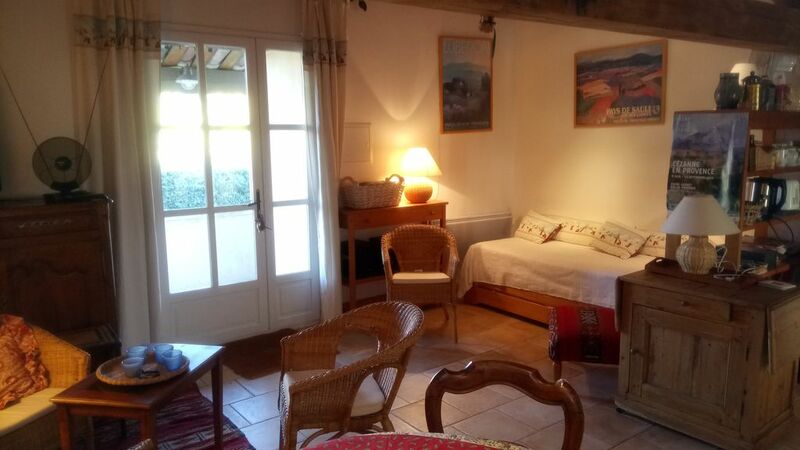 "We have no hesitation in recommending this Gîte in beautiful Provence. It is well situated in the countryside and very tastefully decorated. Monsieur & Madam were very helpful and a bonus was their good command of the English language which we regret we needed." Sehr freundlicher Empfang durch die Vermieter. Schön eingerichtete Wohnung, ruhig gelegen. Sehr zu empfehlen. Nos hôtes allemands très sportifs et très sympathiques ont pu apprécier la qualité et le calme des lieux .Ils étaient accompagnés de leur chien très propre et très discret.Nous recommandons ces amoureux du sport et de la nature! We had an exceptional week at this petite maison just outside Sault. The accommodation was spotlessly clean with all the equipment we needed to cater for ourselves (although we chose to drive into the village to eat often). The house, which has car parking and a private entry gate, is surrounded by some of the most beautiful French countryside you’ll see; the air is clear and it’s a pleasure to be able to sit in the private garden space and stare at the stars. Josette and Didier were the perfect hosts: discrete, knowledgable about the area and utterly charming. Russell and Lindsey were very pleasant hosts and charming persons;They belong to hosts we do'nt forget and we w'll be very happy to meet them again! They appreciate the life in the country with beautiful skys , beautiful stars , beautiful lavender fields without forgetting marvellous storms! We hope others persons to have this exceptionnel experience with them! nous avons passé 2 excellentes semaines dans le gîte de Josette et Didier. L'accueil et la qualité de la prestation, sans oublier le soleil et les senteurs de lavande, nous ont comblés. Una casa i uns propietaris molt agradables, el lloc tranquil i relaxant situat al centre de la lavanda; val la pena anar-hi. Une maison et une très belle propriétaires, endroit calme et reposant au coeur de la lavande, la peine d'aller là-bas. sympathiques et accueillants. Agréable région pour les balades à pied et le dépaysement." (Text automatically translated) RESTAURANTS, A REGIONAL PRODUCTS AND FALLS IN THE VILLAGES (WINES AND Ventoux Luberon). BEAUTIFUL SURROUNDING. MUNICIPAL POOL. MANY FESTIVALS (ORANGE.AVIGNON.CARPENTRAS.LA ROQUE D ANTHERON ..) AND HOLIDAY VILLAGES, PROVENCAUX MARKETS TO DISCOVER EVERY DAY IN THE REGION, A NEW CENTER Thalasso 15KMS A MONTBRUN LES BAINS.